One of my white-tailed eagle photographs from my last visit to Skye will be featured in the winning portfolio of the 2010 British Wildlife Photography Awards. All of the winning and commended photographs will form part of a series of exhibitions, launching at London’s Hooper’s Gallery on the 14th of October. The portfolio of images are also available for the first time in a book. For a full schedule of the UK-wide exhibition tour, visit the BWPAwards website. 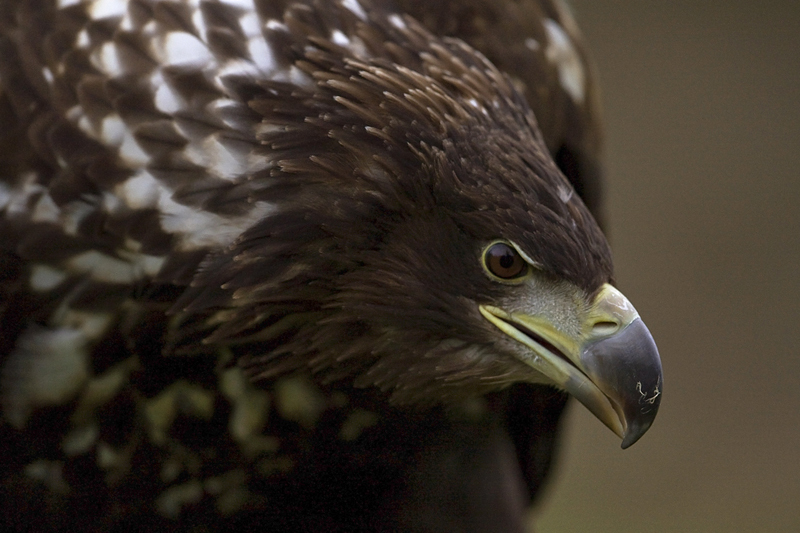 My main site conservationphotojournalism.com features more of my work on white-tailed eagles. Too big for our skies? With Natural England and the RSPB carrying out yet more research, assessments and feasibility studies to see if a reintroduction of White-tailed (Sea) Eagles into Suffolk will have a detrimental impact on the livestock farming industry in the area, one would be forgiven for thinking they were readying themselves for a good old-fashioned western duel, not initiating a conservation project. The immortal threat of ‘this town ain’t big enough for the both of us’ permeates the attitude of the old-fashioned society that these conservation bodies are up against, generally intolerant of anything with a predatory disposition. Unfortunately for our birds of prey, far too many ‘conservationists’ fall into this club as well, intent solely on protecting pretty song birds and ground-nesting game birds. It’s astonishing the number of people that I’ve met over the last year or more who all regurgitate the same line of ‘there’ll be nothing left’ when the topic of a White-tailed Eagle reintroduction comes up, as if the bird is some rabid tiger with huge pterodactyl wings. Yes, they are known to take lambs but there are measures that can be taken that don’t include poison or firearms. The birds, mammals and fish that we see around us in Britain today all survived the period when the eagle lived here naturally before we extirpated them, so what would be different if they were to be reintroduced? Or have our interests in self-preservation reached such levels that we honestly believe there is no space for any top predators other than ourselves? I recently returned to Scotland to try and get the shots of white-tailed eagles I felt I was missing from my last visit. The weather was perfect on all 4 days, giving me the chance to capture the eagles hunting at a higher shutter speed and a lower ISO. While all seemed rosy with perfect conditions for the eagles to feed their chicks, truth be known these were one of the lucky pairs after a spell of bad weather had hit western Scotland earlier this spring, meaning that many nests have failed this year. The weather I can put down to luck but the timing wasn’t by chance. I’d planned my visit to Skye for a few weeks after the chicks would be likely to hatch so that the adults would be hunting twice as hard to feed their growing chicks and to keep themselves in shape, providing me with more opportunities to get the shots I was after. With some shots already in the bag from the previous day with the 1d mark3 and the calmest, brightest day of the lot upon us, the timing seemed perfect to try the new 5d mark2 with a 1.4x teleconverter and 400mm f2.8 combination. But, true to the unpredictable nature of photographing wildlife, the eagles didn’t want to budge from their nest, content with digesting the sea bird they had killed before our arrival on the scene earlier that morning. In the end I had to be happy with what I’d captured on the first morning and this gave me the chance to see what other wildlife was thriving alongside the eagles on the island. The trip provided me with my best views of golden eagles and one of my most memorable encounters with a pair of otters. Also, knowing that cuckoos are having a hard time of it at the moment, it made it all the more rewarding that by the end of the trip we’d seen 5 of these charismatic birds. In true Scottish style however, the warm weather following spring rains also meant one other thing – midges! In all, it was again plain to see how important white-tailed eagles are to the local community. Sentimentality aside, a bad nesting season such as this one can have knock-on effects for tourism and the local economy and that came across in my conversations with those people whose lives are intrinsically linked to the presence of these magnificent birds. What a week! To spend a week photographing in April in west Scotland and to not have any rain is good going, plus to see six white-tailed eagles and interraction between pairs at three of Mull’s nesting sites was something special! The white-tailed eagle (also known as the sea eagle) is the UK’s largest bird of prey and the 4th largest eagle in the world. While I’m used to photographing large birds in Africa like the martial eagle, let me tell you…these birds are huge! White-tailed eagles were persecuted to extinction in England 200 years ago and the UK’s last bird was shot in Scotland in the early 1900’s. It wasn’t until 1975 that a reintroduction programme in Scotland’s western isles was implemented using birds from Norway. Ferries carry hundreds of thousands of visitors to Mull each year and with eagle watching related tourism generating upwards of £1million annually for Mull’s economy, the reintroduction programme is clearly economically viable. After the success of the eagles on the west coast, a project to develop a population in East Scotland is now also underway. However, it seems that the English public will have to wait for further consultation and debate to conclude before they get the chance to see white-tailed eagles fishing Norfolk’s waters after plans for a reintroduction programme there were met with resistance. It is the threat to livestock, especially lambs, and amber conservation status birds like the avocet that concerns those opposed to the planned reintroduction in Norfolk. 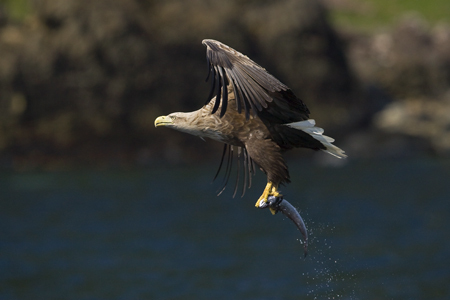 However, white-tailed eagles enjoy a varied diet, eating mainly fish and carrion. Based on experience of eagle management in Scotland, there is also a belief that wild eagles can be tought to feed on rabbits and other food rather than lambs by carrion being carefully situated. Despite their green credentials, the threat wind turbines pose to white-tailed eagles is a concern to conservationists and with further wind farms planned for the North Sea and east coast, any reintroduction of eagles to Norfolk could be affected.